Scaffolding accidents in Brooklyn and other construction accidents can lead to serious and fatal injuries. Despite complex regulations and industry standards intended to protect workers from the dangers of scaffolds, many individuals and families continue to suffer the devastation of scaffolding injuries and death. If a loved one has been injured or killed in a scaffolding accident, you may be entitled to recover significant compensation under state and federal regulations related to construction site safety and operations. 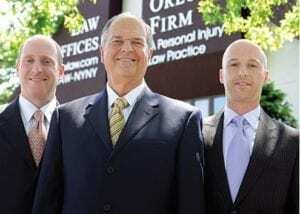 The Orlow Firm is a team of Brooklyn scaffolding accident lawyers experienced in recovering maximum compensation for the families and victims of construction accidents. During more than 30 years of service, our attorneys have handled thousands of cases, but we understand that each one is different. To learn how we can help you, call (646) 647-3398 or contact us online. We serve injured clients in Brooklyn, Brooklyn, Brooklyn and Manhattan and throughout New York. Scaffolds are common dangers in the construction industry. The Occupational Safety and Health Administration (OSHA) estimates that 2.3 million construction workers — 65 percent of the construction industry — work on scaffolds frequently. About 4,500 people are injured and 50 people die in scaffold accidents every year. Using evidence, experts, legal knowledge and strategy, our Brooklyn scaffold accident attorneys are able to advocate for your family to help you recover the compensation you deserve. We will work hard to ensure that you recover damages from all negligent parties, including third parties such as building owners, subcontractors or scaffold manufacturers. We will ensure that the spirit and the letter of Labor Law 240 (the “Scaffolding Law”) is used to your advantage as it applies in your case. To learn more, visit our construction accidents practice center. Even if you are receiving workers’ compensation benefits, you may be eligible for additional damages if a third party (someone other than your employer or a co-worker) caused your injuries. Examples of third parties include scaffolding manufacturers, a subcontractor who erected the scaffold or a landlord. Settlements and verdicts awarded to victims of scaffold accidents caused by third-party negligence are typically much greater than workers’ compensation awards. If you or a loved one has been injured in a scaffolding accident, let our Brooklyn construction accident attorneys at The Orlow Firm show you how we treat our clients. You will always work with a named partner. You should expect nothing less of an attorney handling your construction injury case. Our cases are handled on a contingent fee basis, which means that you will pay no attorney fees until we obtain compensation for you. Se habla español. Call (646) 647-3398 or contact us online to schedule your free consultation.